Probably beatable with a vacuum cleaner w/ hose attachment. Just get it to close, then grab the thing from the center as it opens back up. The petals’ edges need to be sharpened and shaped so that they can close tight. Perhaps you should go examine how a real flower’s petals overlap, open, and close. They are not shaped to form an exact seal, they are uneven and overlap. I would buy this if it were a product for sale, and leave it on when people came over, with no explanation. Heh, that sounds fun. I’d have to replace the pebble with a piece of candy, and paint a dab of fake blood on the petal tips; just to make it more attractive/repulsive. Reminds me of the sunflowers from Larry Niven’s Ringworld. Those sun flowers could act as a parabolic mirror and directing sunlight to a perceived enemy. Only as a group they could do serious harm (if I recall correctly). Made by one of the (extinct) slave races to fight against their masters. This flower acts more like a Venus fly trap. But you’re right (of course), they do look like those flowers. Maybe someone could make an actual one? Or put solar panels on it and have it track sun light and charge your portables while maintaining its original idea of snapping shut. This concept was originally developed at CMU using a kit known as the TeRK (based off of a controller called the QWERK from Charmed Labs). Interesting to see it here again..
2007? I think I saw antiques using mechanical ways to do this so I’m sure the electronic version has been made decades before 2007 too surely. 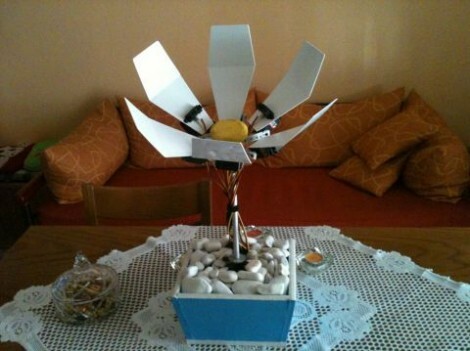 Couldn’t you make this with only one fast servo that would pull them down and close all the petals, like a lever? I think it would be more efficient to have the petals mounted on the servo horns, not the servo bodies, to minimize strain on the servos. Otherwise, cool project! How much $? I want one. So if I grab the pebble am I a ninja? It also needs electrified petals. How about using a single cheap solenoid, rather than 6 relatively expensive servos? In fact, with a solenoid you wouldn’t even need the arduino, just a simple analog circuit. If you found that video “exciting” here’s another one. LOL would be interesting to know how many viewers bailed out. Also, if you noticed the reaction time in the video, you would see that noone would have any problem grabbing the pebble before the thing snapped shut. The guy literally had to hold his hand there for a second before the thing responded. love the flower… kind of looks painful if it actually catches your hand..
who said greeks were broke ?